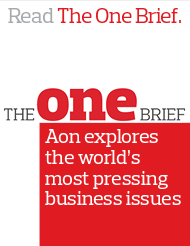 Aon’s crisis management practice helps you quantify and qualify your exposure to the threats of terrorism, kidnap, extortion, product contamination, product recall, piracy and political risk – ensuring you have the most appropriate and cost effective risk management strategy. Terrorist attacks, high profile kidnappings, extortion, political insurgency or employee litigation are some of the growing risks that companies face. They could affect your organisation’s workforce, property and contracts and have a significant impact on business operations and shareholder value. How rapidly and effectively you react in a crisis is critical. It can make the difference between recovering well, or not at all. Aon’s crisis management practice has a unique, consultative approach that helps you quantify and qualify your exposure to the threats of terrorism, kidnap, extortion, product contamination, product recall, piracy and political risks, and helps ensure you have a robust and comprehensive strategy around risk retention, mitigation, transfer and management. Crisis management creates innovative, bespoke solutions, delivered through a combination of insurance market expertise and risk management strategy to help you protect your people, assets and brand. Please use the links to the right to find out more about crisis management’s unique products and services.